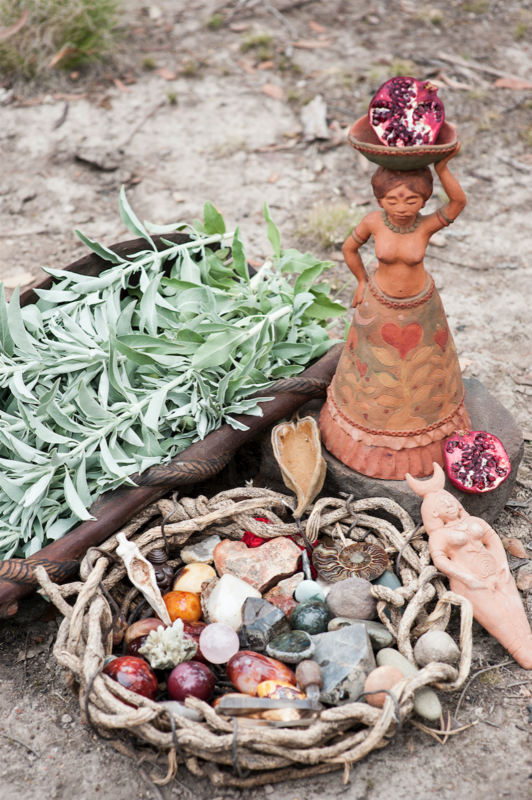 This 13 Month journey of Initiation, Earth Medicine, Womb awareness, feminine embodiment practices and sisterhood, culminates with a 7 day Womens Moon Quest. From the moment that you say YES to this work, you are in the hands and heart of a reality that is infinitely vaster than our minds are able to comprehend. Kaggi and Sh'ana have been faciliatating the 13 Moons Journey for 16 yrs. 13 Moons is a fusion of women’s temple and the tribal ways. This is a once in a lifetime adventure along shamanic paths of mystery, medicine and ancient earth temple wisdom. When we come into being with the infiniteness and wisdom held in our wombs veils of illusion are lifted and we are shifted out of our minds perceived sense of separation. Beyond separation our bodies are temples, the earth our mother and as women we can begin to truly honour the light and love of the spirit of the divine feminine and masculine and sing the beloved up upon the earth. As our capacity to love grows, love will call us to love the unloved and seemingly unlovable aspects of ourselves. Together we create the rituals that will hold us and stoke our passion fires and reveal our gifts. The Chanting and Feminine practices open our voice’s, our minds, hearts and bodies to the divine beauty that we are. Through a cycle of initiation ceremonies we redefine our relationship with our womb, our blood, our body, our sensuality. We forge new connections with our sisters, with Man and the Divine Masculine within, to the Earth, the Moon and all of Creation. As initiated women, we perceive the individual threads within the weave of universal life as much as being able to see the life we weave. The ideas we have around sisterhood are often unravelled and we are asked to step beyond our polite separateness and into a rich pool of honesty and vulnerability. Quest is like the earth temple from which you emerge new, You will come to understand not only your gifts as a daughter of the earth but also the duties and responsibilities that come with them.. This will be the 7th cycle of the 13 Moons journey and over the years that we have been offering this profound journey an extraordinary sisterhood has formed. We acknowledge that it is each of these woman who have given their blood and tears, their support and commitment, their laughter and their vision in co-creating what this journey is today. Many of these women continue to support the 13 moon circle and will act as sister midwives to you during your journey. you would fall to such depths within. From chants and eagle wings, to sacred circles and ocean cries. Final one day crowning Circle. The 13 Moons Womb journal and calendar. Each circle is held in a tipi or yurt temple space in the beauty of the hills of Macedon Ranges and by the river in Kangaroo ground, Victoria. The Women’s Moon Quest Is a five day women’s quest held on 160 acres of beautiful forest in Victoria. There is a support team of up to 20 women who hold and midwife this potent space for you. Prior to Quest we will have a weekend of quest preparation on the quest land. Quest is an amazing opportunity to sit for 4 days upon the mother earth opening yourself to receive, dream and fall beyond yourself into the still, silent beauty of creation around and within you. Moon essences are created within the ritual space each circle. These facilitate in your unfolding and integration between circles.